Leave a little sparkle wherever you go. I was given the go-ahead on redesigning an upstairs main bathroom. Anytime I get the opportunity to redesign a room I get super excited because just like an event, you have ideas which are translated onto paper, but then you get to take those ideas and see them come to life when you put them in a room. The house is about twenty years old, but still in really good shape, as the house has been renovated throughout the years. The vanity currently in the bathroom has been updated since move-in, however, it could still use a facelift. We decided to leave the bath tub as is, because although a few years old, still looks good, and it can be covered with a shower curtain anyways. The color board for this room is monochromatic, so there will be greys, blacks and whites. The pop of color will be greens. It is always nice doing a neutral bathroom because it always looks clean. People get the wrong impression with bathrooms and feel that everything has to be white, from the bath tub, to the vanity, to the floors — this isn’t the case at all. Have fun with your bathroom, but remember, it is a small room, so take that into considering when designing. We are adding to this bathroom — a new vanity, a new toilet and new flooring, and of course, a new color to the walls. We chose this Vanity, bought from Costco, as the focal point of the room. 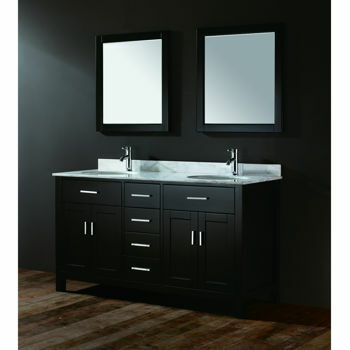 This vanity is espresso in color and is solid hardwood with a Bianco Carrera marble counter top. This vanity has a lot of storage, including 8 different drawers. This vanity also comes with the 2 wood-framed mirrors seen in the picture above. 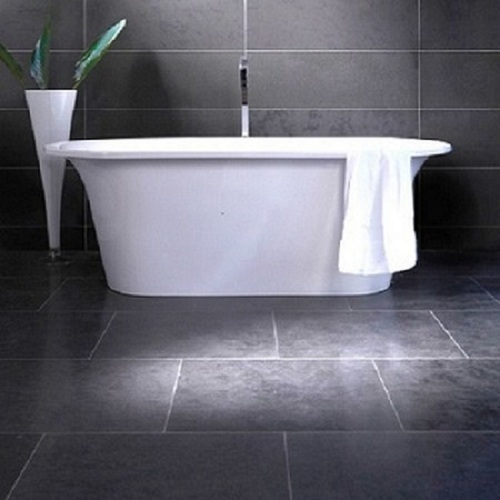 Considering there are light floors in the bathroom right now, we decided to do a drastic change and do all of the floor tiles in grey slate. The exact brand of floors has not been picked out yet, but we know the type of floor and the specific look as well, so we are still shopping around. As seen in the two pictures, one is rectangle tiles, whereas the other one is square – either or would look good in the bathroom space, just again, keep into considering how big your room is. If you a bigger bathroom to work with the rectangle will look great in the room, the square tiles are more for a smaller bathroom. Accessories are add ons in every room. For this specific bathroom, with the dark grey floors and the black and white marble vanity, I decided to do silver accessories, to bring a little bit of brightness into the bathroom. 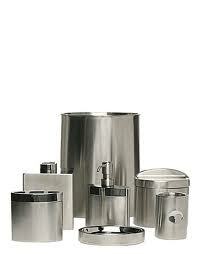 Continuing with the modern theme of the bathroom, we will continue that with the accessories as well. 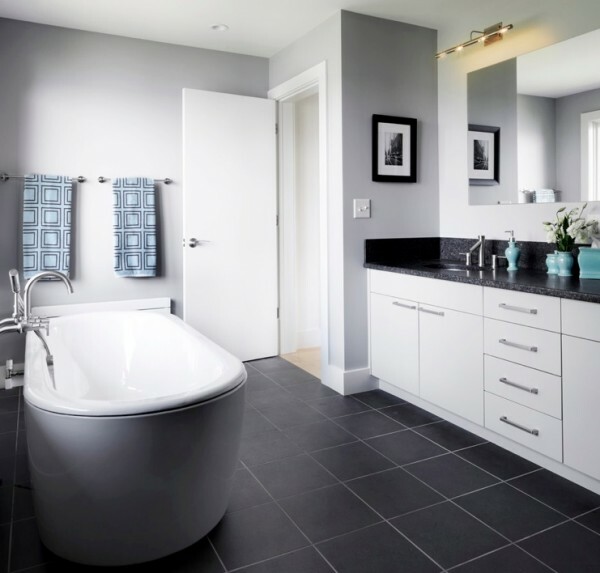 With silver accessories, dark slate grey floors, and a black vanity with a white marble countertop, we still want to keep the room monochromatic. 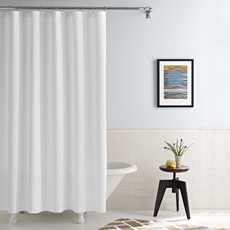 With a white bathroom curtain it will still keep the room modern, but it will lighten it up a bit. 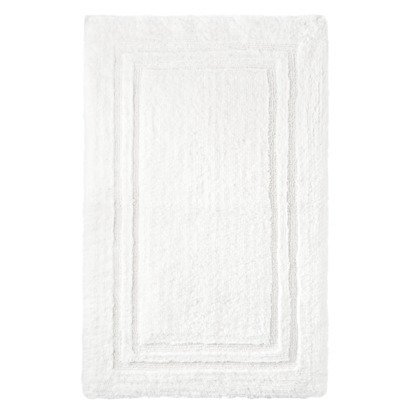 Matching the shower curtain with the rug will tie in the colors of white. It will also keep the room looking uniformed and sophisticated. Lastly, comes the towels. 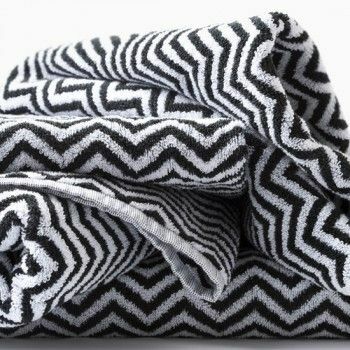 Incorporating black and white into the towels is a nice modern touch and with these black and white herringbone towels it will tie everything in together nicely. If you do not one to showcase this bold print, you can always do a larger white towel, with a small black face towel draping over it, the decision is yours to make. With a monochromatic room, you have the option to bring some outdoor colors inside. 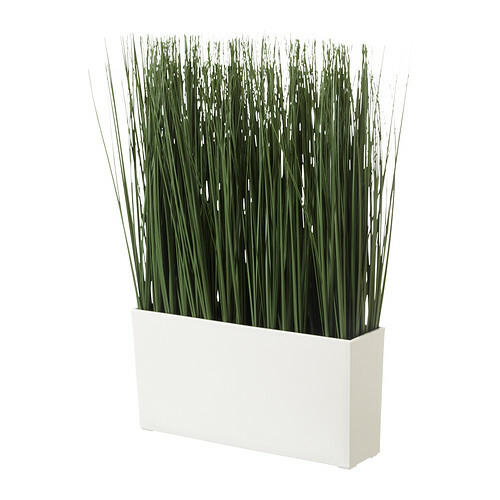 Fake plans are a great idea and these plants from IKEA would look nice in the room, maybe sitting on top of the toilet, or you could place both on the bathroom counter. I would not do the plant with a white base though due to the white marble counter tops, if you could find one with a black base that would be even better. The modern element here is the rectangle base, try to find one similar to this, as a rounded base would take away from the feel of the room. 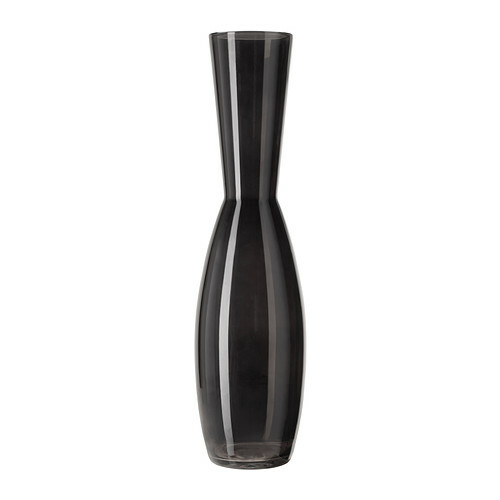 If you wanted to do a taller vase instead with draped flowers instead, that would look good as well. The last decoration that I have added to this room, is a canvas that will hang above the toilet. The picture will remain in grey scale and will be from IKEA. The last time I went to IKEA they had a skyline picture of Toronto, being that this is where I live, I thought it would be a great way to incorporate that into the room. If that picture is not available, any grey scale picture would work. 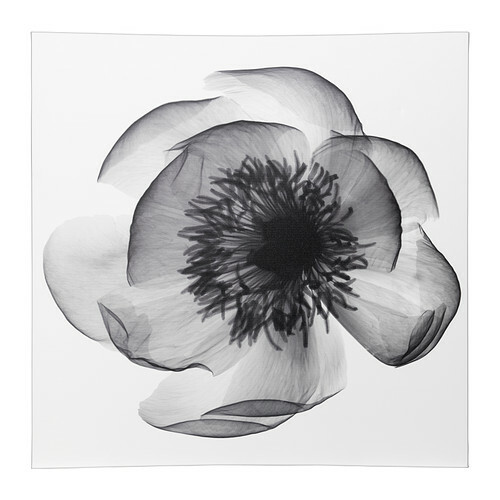 You could even do a 3-1 split canvas, where you have one image, but it is separated into three different sections – these are very popular right now.